Officers of The Ohio State University Alumni Club of Champaign County with new students are, from left, Chris Harmison, treasurer, Gretchen Klingler, Loren Coffman, David Martin, Kristoffer Hamilton, students, and Richard Van Buskirk, president, and Jill Michael. 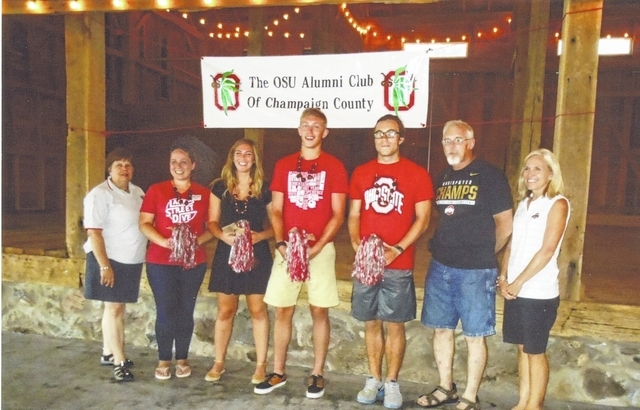 The Ohio State University Alumni Club of Champaign County met to honor OSU incoming freshmen, those transferring in for advanced work and their parents. Todd and Jill Michael hosted the event. The winner of the Champaign County Alumni Club Scholarship, David Martin, was introduced. Buckeyeman (Larry Lokai) presented each student with a buckeye necklace. The club voted to retain the current officers. Members were advised to watch for the various activities coming up, which add funds for the Scholarship Fund. The meeting closed with the singing of the Alma Mater, directed by Janet Ebert. https://www.urbanacitizen.com/wp-content/uploads/sites/36/2015/07/web1_frosh.jpegOfficers of The Ohio State University Alumni Club of Champaign County with new students are, from left, Chris Harmison, treasurer, Gretchen Klingler, Loren Coffman, David Martin, Kristoffer Hamilton, students, and Richard Van Buskirk, president, and Jill Michael. Submitted by the Ohio State University Alumni Club.